So the title is in reference to the Wu Tang Clan and the Wu Wear they made famous. Though I am am not a crazy Wu fan, I do appreciate their shaolin style, but I digress. This weekend I spent doing some "fixer uppers" on my brew house. While all this was going on, I kicked the Pumpkin Ale and the Brown Ale. Both will be missed, but the dobblebock is now on tap and that is worth writing about. This post is going to be a mishmash of my projects and drinking so away we go. First off, after all of the problems I had with the mash tun, I knew it was time for some adjustments. The way that the false bottom had previously worked was a barbed nut going to a very short piece of rubber hose, from there a small piece of copper slid into a hole in the 1/2in copper tubing that made up the false bottom. The plan to improve this was to was to create a more permanent connection from the false bottom to the ball lock valve. I started by moving the location of where the liquid exits the false bottom. As pictured, I relocated the exit point of the runoff from the front of the false bottom to the center. 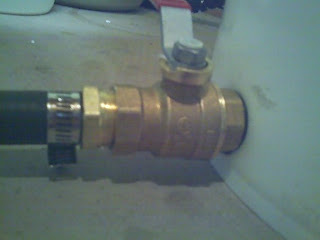 This was to allow me to runner full copper with soldering from the false bottom to the ball valve. From here, I created a connection from the ball valve to the newly relocated false bottom exit point. 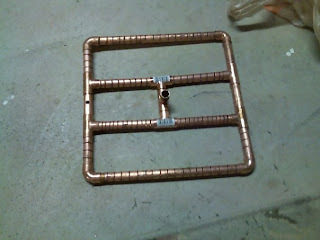 For this, I used a 1/2in copper fitting nut and a piece of 1/2in copper pipe. 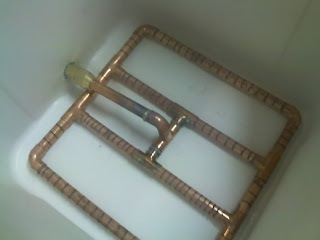 I connected the copper tube to a copper corner piece with solder to create a permanent connection. I did not solder the connection from the corner piece to the false bottom because I wanted to maintain some wiggle room. In the end, I had a new connection between the ball lock and the false bottom that could still be taken out of the mash tun and properly cleaned. So after my many, many failed attempts at building a sparge arm that would work, I think I have have something now. In the process of creating a successful sparge arm, I still managed to fail at an attempt to save the previous copper sparge arm that did not work because of the hose. In the long term though, i established that a hanging sparge arm would not work because we are now brewing 10 gallon batches and there is not as much room in the mash tun there once was. As you can see in the picture below, I attempted to make the copper sparge arm a floating sparge arm instead of the hanging sparge arm it currently is. This was a failed attempt. The foam that I used to make it float was glued on, but the glue did not hold and got all over the copper. There was not saving it. Starting with a clear slate, I decided to use my bottling bucket for the reservoir, high temp hose to run the water from the reservoir to the sparge arm, and PVC pipe for the actual sparge arm. With the bottling bucket, I had to get a 3/4 ball valve and i used the plastic nut from the bottling setup to secure the ball valve into the bucket. 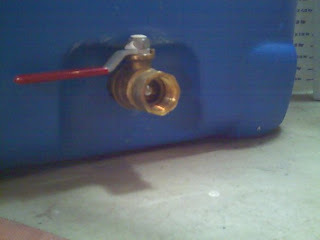 I used 5/8 in inside diameter hot water hose that is rated at boiling temp for the hose. I used barbed nuts for the connection to the ball valve and the connection from the new PVC sparge arm. 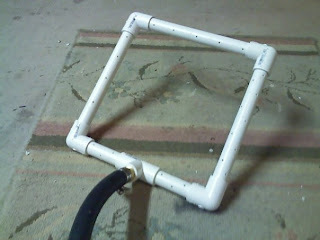 Finally I made the sparge arm out of PVC with small holes in it. It's pretty simple, a square with holes in it that goes to a T. PVC is cheaper and easier to work with than copper, I wish I had done this originally. It doesn't float above the water, but it should sit on top of the gain bed without sinking and slowly disburse water. The ball valve is clutch here because you can adjust the flow with relative ease. So now a quick update on my brewing situation. I have a Kolsch and the Yeti clone both in secondary. The Yeti was way too much on the oak side, this concurs with Nick's opinion that splitting the full pound for the 6 gallon batch was overkill. I would have to say that his opinion that we would be good with an ounce in each primary fermenter was correct. Because of the overwhelming flavor on the yeti and the fact that I lost some quantity, I decided to top the yeti off in the secondary with about two quarts to a 1/2 gallon of water. Hopefully this take some of the extreme flavor off this brew. Otherwise it is close to undrinkable. The kolsh is good, but cloudy. There was a lot of stuff still floating around. I topped this one off with water in the secondary as well. Currently it's still bubbling in the carboy so I think that I may need to cold store this one for a while to clear it out. Finally I have my dopplebock on tap now and my red ale still waiting to fully carbonate. The dopplebock is OUTSTANDING. It's totally smooth. All of the roasty malt flavors are really smoothed over during the lagering process. This makes the whole experience really enjoyable. there is no alcohol burn on this brew at all and it about 7% abv, that's pretty impressive. As you can see, great color, great head retention. I am very happy with how this turned out. It makes the wait all very worth while. 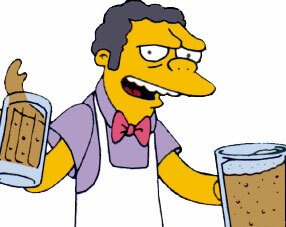 Since I kicked the pumpkin and the brown ale, I think it's time for a brew day! Cash Rules Everything Around Me CREAM Get the MONEY! When I swing my sword they all choppable. I'll be the body dropper heartbeat stopper, child educator plus head amputater. I'm a convert to batch sparging, so I don't have too much to say here. But I noticed in photo of the fermenting beer...that you are using a plug and a smaller diameter hose. Never thought to do that, but I think I'll try it. This might at first seem like a stupid question but...Do you reuse the hose, or do you toss it after each batch? Congrats on the Dopplebock! I wish I could trade something for it. Don't you love it when a lager comes out rockin? Yea I jam the hose through the plug after everything is sanitised. I had a bunch of like 1/2in or so inside diameter hose I picked up at one point and had no use for it until this. In the primary, I do the same thing out of the bucket. The right sized hose makes a nice tight fit. I reuse the hose. I don't really think things through very well and it's never occurred to me that it might be a potential source of contamination. You know what they say; God protects fools, drunks and children! I am up for a trade, what do you have for me? I would ask that you give me a good judging though. Email me at travis@cnybrew.com and we can work something out.